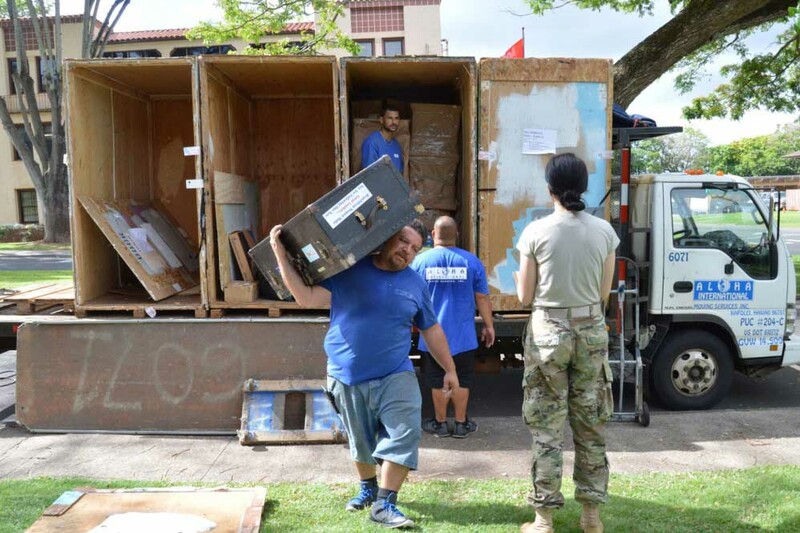 A local moving company unloads a Soldier’s household goods for a PCS move to U.S. Army Garrison Hawaii. The Army has created a new office at Fort Knox to process Soldiers’ claims for personal property losses incident to government service, known as the Center for Personnel Claims Support, or CPCS. The new center will be fully operational July 5, 2017. Photo courtesy of Karen Iwamoto. FORT KNOX — The Army has created a new office at Fort Knox to process Soldiers’ claims for personal property losses incident to government service, known as the Center for Personnel Claims Support, or CPCS. The new center will be fully operational July 5, 2017. These claims are known as personnel claims and include claims for loss or damage to household goods and privately owned vehicles during PCS shipment, or while stored at government expense. Personnel claims also include loss or damage to Soldiers’ personal property located in government quarters or other authorized locations, caused by events such as storms, floods or power outages. Army civilian employees also are eligible to file personnel claims under certain circumstances. The new CPCS will process all claims of Soldiers and employees stationed in the continental U.S., Alaska, Hawaii and Puerto Rico. Soldiers filing claims overseas — including those stationed at U.S. Army Garrison Bavaria — will also file claims online. For assistance processing these claims, however, Soldiers, employees and families should contact their local Staff Judge Advocate or legal office, not the CPCS. How does this affect the claim filing process? In the case of household goods damaged or lost during a PCS move, DOD personnel still must file their claims directly with their Transportation Service Provider, or TSP, under the Full Replacement Value program. The pink form (DD Form 1840/1840R, entitled “Joint Statement of Loss or Damage at Delivery/Notice of Loss and/or Damage”), will continue to be submitted within 75 days from the date of delivery directly to your TSP. Remember that submitting the Notice of Loss or Damage form does not mean that a claim has been filed. In order to get full replacement value for their loss, Soldiers and employees must file a complete claim with the TSP that includes detailed information on damaged items, such as the original purchase price, repair estimates and replacement costs, within 9 months from the date of delivery. That mandatory part of the claims process will not change after the CPCS stands up. But, after July 5, 2017, if the TSP does not act on the claim or is unable to reach a reasonable settlement with the claimant, the Soldier or employee no longer will file the unsettled claim with their local Staff Judge Advocate or legal office. Under the new process, Soldiers and employees will file those claims online and electronically submit required documents to the CPCS using an upgraded program called PCLAIMS Plus. All personnel stationed in the U.S. will be able to file a claim electronically with the CPCS beginning July 5, 2017. Access to the online claims portal requires CAC access or other means of authentication for recently retired or separated personnel. Those without a CAC should call the CPCS directly. On that date, CPCS personnel will be available to provide customer service support for processing claims over the web, directly by phone or through email. For more information on the claims process, service members stationed in the U.S. can go to PCLAIMS, call the center at DSN 536-3000, CIV 1-502-626-3000, or send the CPCS an email at usarmy.knox.hqda-otjag.mbx.cpcs@mail.mil. Personnel stationed at USAG Bavaria should contact the 7th Army Training Command Staff Judge Advocate claims division for assistance filing and processing claims. For more, or to schedule an appointment, contact the Tower Barracks Claims Office at DSN 475-8428/6540, CIV 09641-83-8428/6540; the Rose Barracks Claims Office at DSN 476-2240/2289/3318, CIV 09662-83-2240/2289/3318; or the Hohenfels Claims Office at DSN 466-2471, CIV 09472-83-2471.